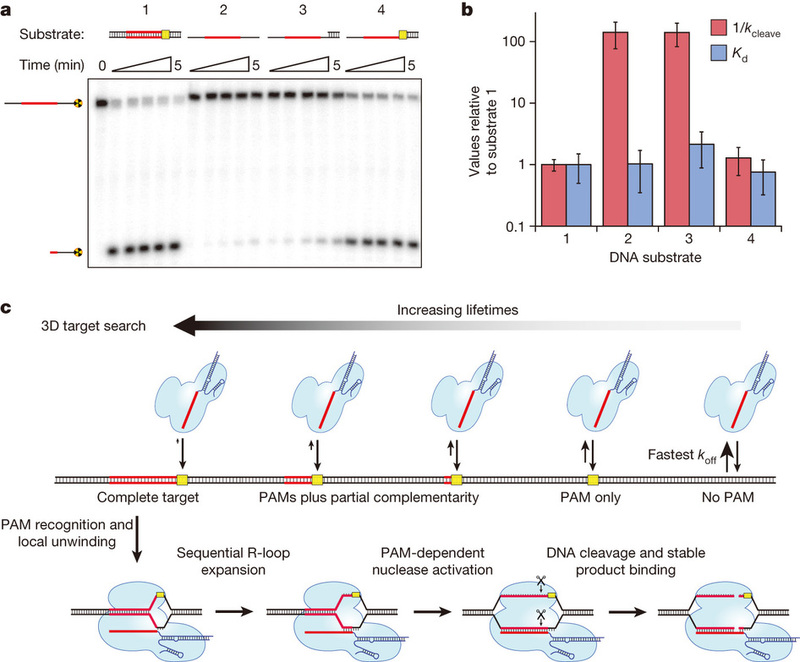 The following page summarizes an application of single-molecule fluorescence, specifically work done by Samuel H. Sternberg, Sy Redding, Martin Jinek, Eric C. Greene, and Jennifer A. Doudna: DNA interrogation by the CRISPR RNA-guided endonuclease Cas9. Nature 507(7490), 62–67 (2014). 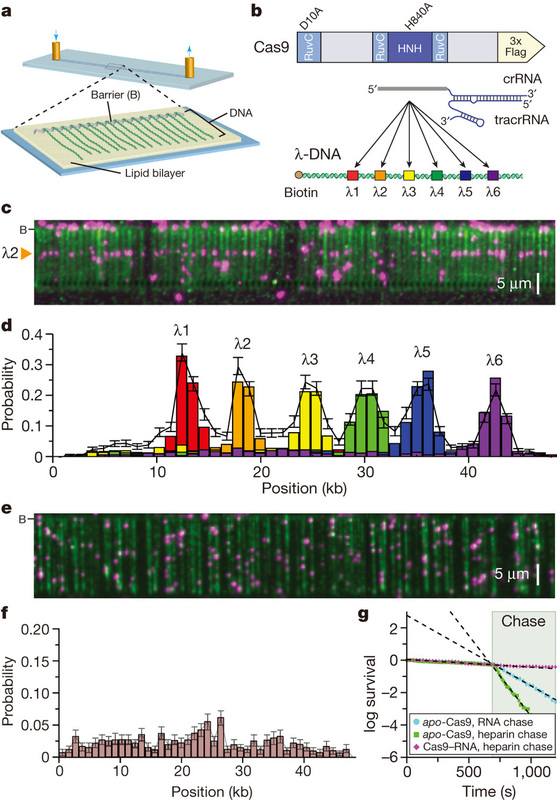 In the above paper by Doudna and colleagues, Total Internal Reflection Fluorescence Microscopy (TIRFM) was used to achieve a Single Molecule Fluorescence visualization of Cas9 binding events. In TIRFM, light reflecting off of a glass surface creates an evanescent field of excitation light beyond the interface. The field, able to excite molecules within roughly 100 nm of the glass, gives fluorescent outputs with significantly lower background fluorescence, and thus a higher signal-to-noise ratio compared to conventional fluorescence microscopy (Reck-Peterson et al. 2010). Figure 1a shows the flow cell with a DNA curtain assay that was used to study the Cas9 mechanism. 1b shows the mutations in each nuclease domain rendering the Cas9 inactive, creating a dCas9. 1b also shows the 6 sites that the guide RNAs are designed to target, once the guide RNAs are complexed with the Cas9 protein. 1c shows the TIRFM images of the DNA curtain assay (stained green by YOYO1) and Quantum Dot-tagged dCas9-guide RNA complex binding to the DNA. 1d shows the dCas9 binding distributions, corresponding to the correct sites that are complementary to the guide RNAs. 1e demonstrates the binding of Cas9 without guide RNA (apo-Cas9), and 1f shows the binding distribution. 1g shows the log survival curves upon addition of heparin to Cas9 with guide RNA, and apo-Cas9, and upon addition of RNA to apo-Cas9. These curves demonstrate that Cas9 complexed with a guide RNA will not be affected by the presence of competitors. Cas9-RNA interacts with the DNA in a manner very different from apo-Cas9. Biochemical experiments revealed Kd’s of 25 nM for the apo-Cas9 and 0.5 nM for the Cas9/guide RNA complex. Cleavage competition assays with Cas9-guide RNA acting on substrates including PAM sequences demonstrated that PAM binding is an integral component of Cas9 activity. Figure 4a shows the results of a cleavage assay with varying substrates, all of which were complementary to the guide RNA. Those sequences containing the PAM were cleaved with much greater efficiency than those without. Figure 4b shows that the relative binding affinities are comparable, however the cleavage of the strands not containing the PAM sequence is very inefficient. Essentially the Cas9-guide RNA requiresthe PAM sequence to function with nuclease activity. Figure 4c shows a putative model for PAM recognition regulation of Cas9 nuclease activity. This model corresponds to the data collected via the DNA curtain assay, and cleavage assays, and has been supported by the PAM binding model put forth by Anders and colleagues.